This whimsical journey brings to life the classic tooth fairy character and her tooth-goblin helpers. This story is sure to help every child ease the fear about losing a tooth. 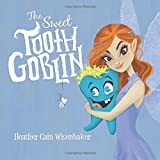 A wonderfully illustrated and imaginative spin on the tooth fairy, this book and pillow will create the perfect fantasy for your child to visit every time he or she hugs his or her very own Sweet Tooth Goblin. The Goblins have become the tooth fairy?s biggest helpers. They make it easy to locate the tooth and add a safe place to secure money or gifts for the child. The book is easy to read and wonderfully illustrated to help your child?s imagination soar.